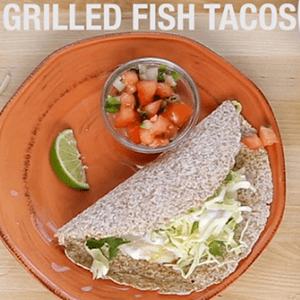 This recipe for Healthy Fish Tacos captures all of the fresh flavors of a true Baja-style fish taco. Cod is lightly seasoned with salt and grilled (or broiled) until moist and flaky. Fish cooks quickly, so keep an eye on it until it’s done to your liking. If you have access to freshly made whole wheat tortillas, you would be a very lucky cook. 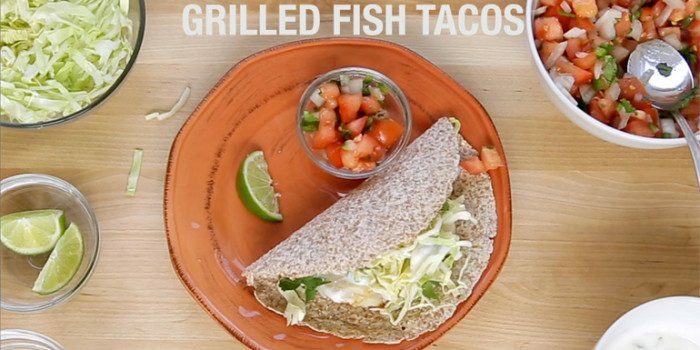 For these, the recipe calls for sprouted, whole-grain tortillas warmed on a flat pan. Top them with shredded green cabbage, a fresh pico de gallo salsa, and a lighter version of créma made with yogurt and lime juice. A squeeze of lime is the finishing touch. Watch the video below to see how they’re made! 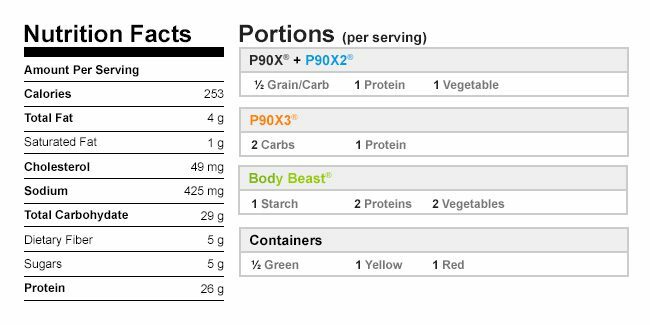 To make yogurt sauce, combine yogurt, 2 Tbsp. lime juice, and 1 Tbsp. cilantro in a small bowl; mix well. Set aside. To make salsa, combine tomato, onion, jalapeño (if desired), and 1 Tbsp. cilantro in a small bowl; mix well. Set aside. Season fish with salt if desired. Grill or broil fish for 4 to 5 minutes on each side, or until fish flakes easily when tested with a fork. Evenly top tortillas with fish, cabbage, and remaining 1 Tbsp. cilantro. Drizzle with remaining 1 Tbsp. lime juice, and yogurt sauce; garnish with lime wedges. Serve with salsa.